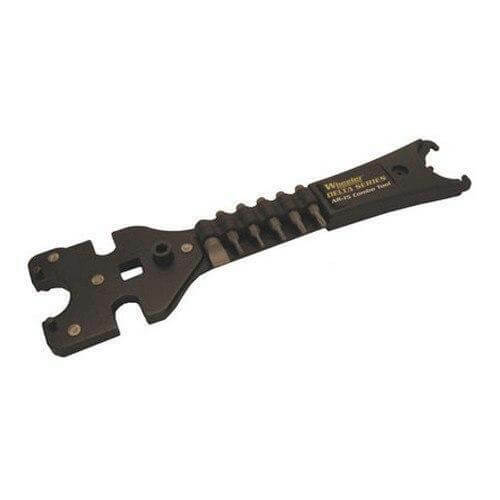 Cover most of your AR-15 service needs with a single tool. An innovative layered and laminated stamped steel construction makes the Delta Series Combo Tool the most durable AR tool available. This construction method allows the use of hardened steel barrel nut pins designed to hold up to heavy torque requirements. A cut out for a ½” drive allows the tool to be used with a torque wrench or ratchet driver. Profiles for buffer tube lock nut and flash hider are included. The addition of a bit driver and bit holder with six common bits adds to the versatility. I was able to do what tool was advertised for, castle nut came off very easy, only let down was where it was manufactured. I was expecting a tool made in U.S.A, but what I got was Made in China. Not a big deal but would not buy it again. Magpul makes a very nice American made Armorers Wrench which does it all. Oh yeah shipping was really fast. Another great product provided by AT3. Shipped fast and does the trick. So glad found you guys!!! Just starting to modify my AR. Acquiring tools as needed. Quality is exceptional and communication and delivery excellent. Another order coming soon!!!! This is the first purchase that I have made and I am pleased with the results. I received the purchase after only a few days. The order was filled accurately and I believe that I got a great deal. I will be making future purchases now that I am comfortable with the process.